Maritime history in Greece, like most things, dates back thousands of years. All the ancient civilizations have their own story of seafaring, exploration and trade routes. Part of the charm of sailing in Greece is that the ancient history is evident everywhere and the knowledge that your Greek sailing charter may be plowing the same routes as her ancient mariners adds a certain something to the experience. 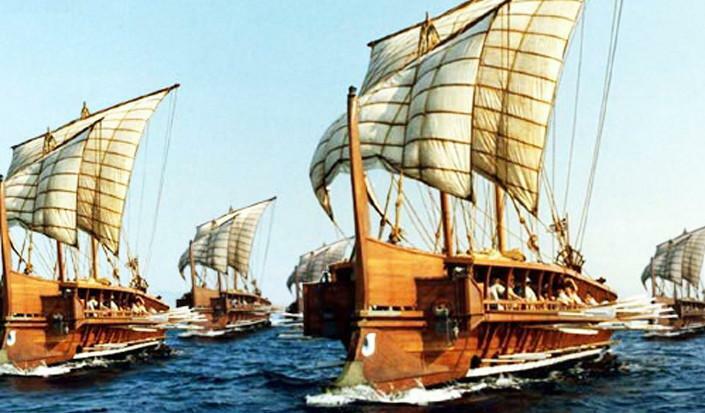 The first evidence of sailing in Greece was during the Minoan age. Minoan traders from Crete, were active in the eastern Mediterranean by 1600 BC trading copper and bronze, seeming to have learned much from the original ancient sailors - the Phoenicians. One of the earliest recorded stories of western seafaring was that of Odysseus, or Ulysses, the Ancient Greek king of Ithaca whose sailing adventures were described by Homer in his epic poem the Odyssey. Although the Odyssey and the Illiad were thought to have been published around 800BC, they both take place in the Trojan War years (1194 to1984 BC) before the invention of the Greek Alphabet and written records. According to this epic, it took Odysseus 10 years to return home from the Trojan wars with many adventures along the way including: defeating the Cyclops; disobeying Aeolus, god of the wind; running into sirens and other mythological monsters and being held captive by Calypso before finally sailing home on his ancient sailboat. Another sailing epic from Greek mythology, involves a band of heroes who, in the years before the Trojan War, accompanied Jason to Colchis in his quest to find the Golden Fleece. This crew were referred to as the Argonauts, a name which comes from their ship, the Argo which in turn was named after its builder, Argus. This ancient ship has been reconstructed and can be found in the Greek city of Volos, which is where Jason was thought to have left from. These ancient mariners deified the sea, believing that as man embarked on a sea journey he no longer belonged to himself. In awe of the power of the sea, they attributed it to the great Sea God, Poseidon and left offerings at his temples before every journey, believing that they were liable to be sacrificed at any time to his anger. By the beginning of the Archaic Age (800 to 480 BC), the Greek trireme was the most common ship of the ancient Mediterranean world, employing the propulsion power of oarsmen and sail. Based on archeological evidence this ship was a true technological innovation of the times. This 40-metre-long style of sailing ship was first constructed by the Corinthians around 700 B.C. They needed 150 men just to pull the oars. There would be three files of oarsmen on each side who were initially slaves but in the later years were free men. The trireme sailing boat dominated the Eastern Mediterranean for more than 1.000 years, through the Classical (480 – 338 BC) and Hellenistic (338 to 146 BC) Ages. Through these ages local agriculture had become productive enough to kick off a resumption of maritime trading and new Greek colonies were established in north Africa and the Southern Mediterranean all by the power of the wind! These ancient traders travelled in cargo ships, that could carry a lot of produce, even if they weren’t as fast as triremes. Since Greece is so mountainous, even domestic trade generally went by sea. Sailing against the wind was difficult with the type of sails available and sailing was usually downwind with the famed trade winds of old. Even with the wind, they could only go about five knots compared to the warships that could sail as fast as 14 knots. Cargo ships carried a lot of different produce, such as wine, wheat, olive oil, perfume, glass cups and vases, jewelry and clothing, grindstones, and metal tools. Maritime trade helped to spread Greek culture and civilisation throughout the ancient western world. During the Archaic and Classical periods, most of these ships weighed about 150 tons. Later, in the Hellenistic period (388 – 146BC), the light trireme was supplanted by bigger war ships in the navies of the time. The need for the larger penteconter was mostly due to an increase in armourment carried on board and the use of the ship for ramming and boarding other ships, as Greece engaged in various wars. These bigger ships sometimes had two or even three masts, so they could carry more sails to harness the power of the wind. Triremes continued to be the boat of choice for smaller navies and were used alongside the bigger warships as they were appreciated for their maneuverability. They played a major role in the Persian wars, the creation of the Athenian maritime empire and its downfall in the Peloponnesian wars. The gradual development of triangular sails first appeared in the Late Republic, around 50 BC. They may have evolved from the earlier Greek "brailed" sails, gathered on one side. These triangular sails aided the square sails and were called "lateen" sails, because Latin speakers invented them. Lateen sails were an advantage as they could be used for tacking into the wind, gaining better speed and harnessing the weaker winds.